This is isolated RS485 transceiver with integrated isolated high frequency DC-DC converter (200MHz?). There is a trace connecting pin 11 and pin 14 that crosses the other trace. How should I do this crossing on PCB? Should I create this connection on second layer? 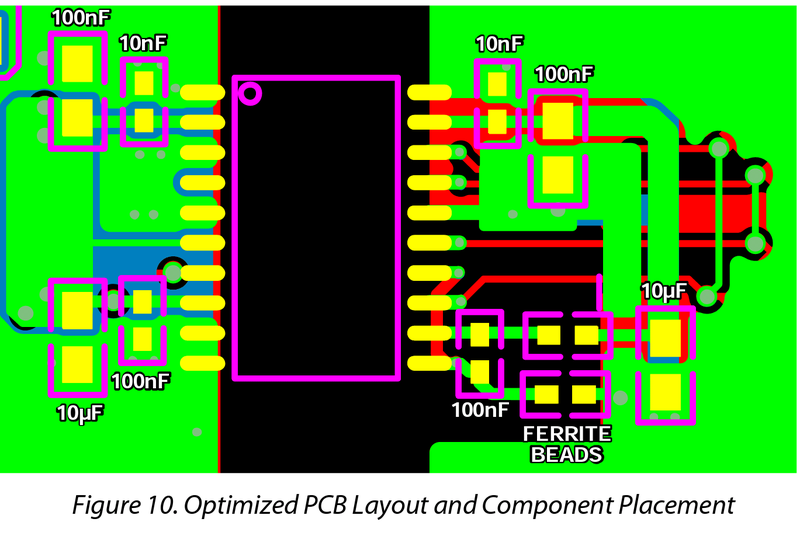 The text in the PCB layout section implies that you should be using either a two or four layer board - it includes tips for improving EMI, and some of them depend on whether you are using a two or four layer board. It also directs you to have a "keep out" area for the ground plane under L1 and L2. This is the same area where C1 and pins 11 and 14 are. 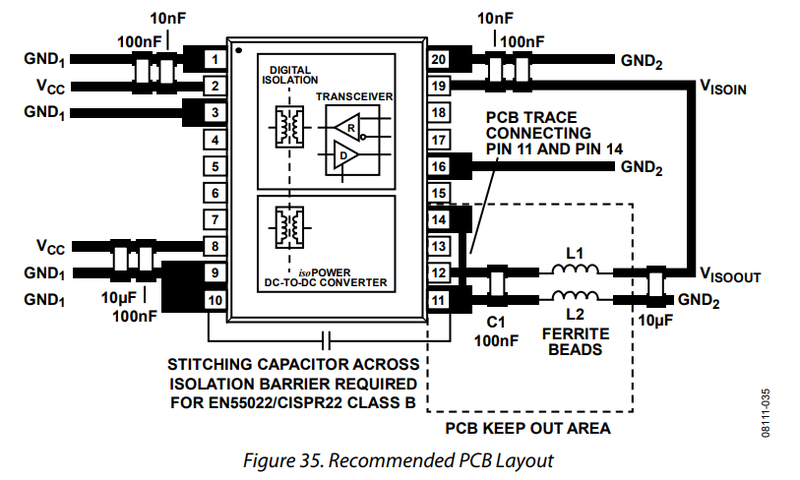 Ensure that GND2 (Pin 14) connects to GND2 (Pin 11) on the inside (device side) of the C1 100 nF capacitor. All of that leads me to conclude that you will have to run the connection of pin 11 and pin 14 on the ground plane layer. There's just no other place for it that fits. The application notes for the adm2582e shows a completed layout. C1 is the 100nF capacitor in the lower right corner by the two ferrite beads. Pin 11 is the lower right pin of the IC. Sometimes the datasheet isn't enough. Often times you can find application notes that help a lot with actually using the parts. Failing that, a look at evaluation boards (and their documentation) can show you what the datasheet really meant. Yes you need to put that trace on another layer. Not the answer you're looking for? Browse other questions tagged pcb documentation or ask your own question.